University of Nevada, Reno Professor Paula Noble and undergraduate geology and geological engineering student Paige dePolo will be traveling to the Nevada State Museum in Las Vegas Wednesday, Dec. 17, to take 3D scans of Ichthyosaur fossils. This is part of an on-going research project and collaboration with the Smithsonian Institution's Museum of Natural History to scan Nevada's state fossils using terrestrial LiDAR, Artec 3D light scanners, and photogrammetry technology. The team is creating 3D models from the data collected with these devices. Photogrammetry takes a series of high-resolution pictures taken at different angels, which can later be stitched together. The 3D scanners and terrestrial LiDAR both creates a detailed 3D surface model of fossil beds. This technology will allow them to create two sets of 3D models for intercomparison, one from the photogrammetry, being completed at the Smithsonian, and a second from the combined LiDAR and Artec scanners at UNR. Terrestrial LiDAR has been used to a variety of engineering and geological applications, but according to Noble and dePolo, using the technology to take 3D scans of fossils is a new application. "Photogrammetry is a tested method whereas LiDAR is a more experimental method," dePolo said. "So by comparing the work the Smithsonian is doing with photogrammetry to our LiDAR scans, we can see if it is a feasible method." 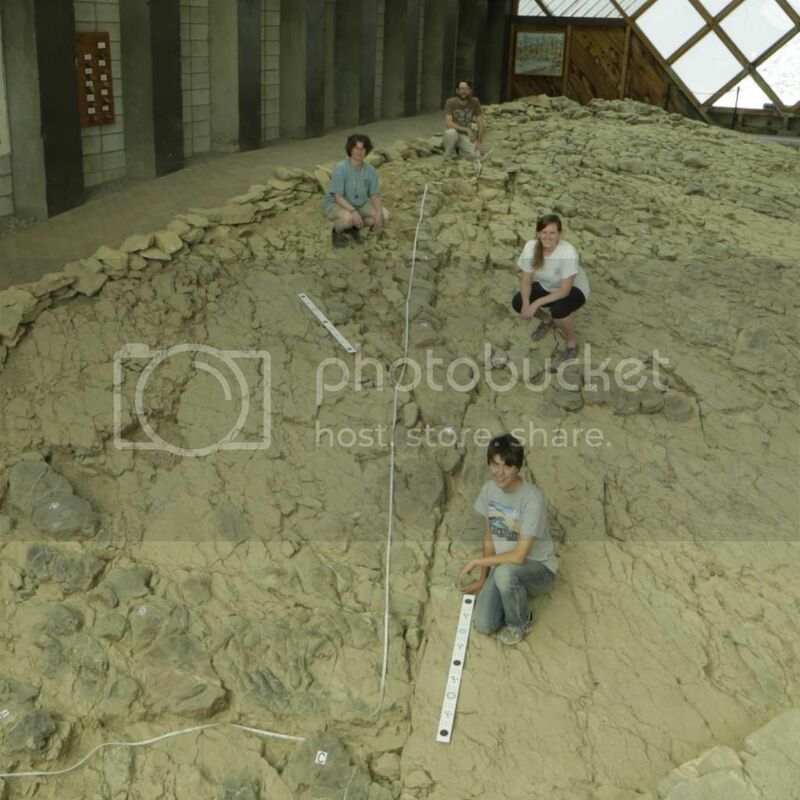 In September 2014, Noble and dePolo had the chance to assist the team from the Smithsonian with their photogrammetry work at the Berlin Ichthyosaur State Park in Berlin, Nev. The park houses nine large adult Ichthyosaur specimens preserved in the rock within the quarry. Noble and dePolo connected with the team from the Smithsonian through a series of rather serendipitous events. "We had been gearing up for this project for about a year," Noble said. "When we were ready to go out to the quarry to use the LiDAR technology we thought the final piece of the puzzle was to arrange it with the park ranger. We were surprised when he asked us if we were with the Smithsonian group." After some research, Noble and dePolo learned about the similar project that Nick Pyenson's lab at the Smithsonian was doing. They connected with Pyenson's team, which includes Ichthyosaur expert Neil Kelley and imaging specialist Holly Little. The team taught Noble and dePolo to use photogrammetry and Noble was able to arrange for equipment for the team such as field vehicles which would have otherwise been expensive for the team to bring out. "It is a mutually beneficial relationship," dePolo said. "Professor Noble and I get to work with researchers and equipment which we never would have considered with our original work plan and for the Smithsonian team it simplified what would have a been a relatively complicated process." Since the initial trip with the team from the Smithsonian, Noble and dePolo, in conjunction with the Desert Research Institute and the Nevada Seismological Laboratory at the University of Nevada, Reno, have visited the State Park two other times to scan the main quarry with terrestrial LiDAR with the help of graduate student Steve Angster. They also used hand-held Artec Spider and Eva scanners purchased by the DeLaMare library, which shoot out beams of light and creates 3D cloud of data points. Noble and dePolo scanned the building on the outside and inside in addition to the fossil site, which is about 25 meters large. They hope to be able to use these scans to create a virtual tour that school kids could use to explore the quarry online. "For the moment, we have finished all the scanning at the field site itself," dePolo said. "We are currently trying to synthesis the 13 scans into one cohesive point cloud." They are hoping to have the processing of the scans done by end of January. This month, they will continue their efforts by visiting the Ichthyosaur specimens in the Nevada State Museum in Las Vegas. "With any successful collaboration, you get a certain amount of momentum and energy," Noble said. "I thought a great addition to the project would be to visit the specimens from Berlin Ichthyosaur State Park, which now reside in the museum in Las Vegas." Noble and dePolo will bring the hand-held 3D scanners and meet Kelley to do smaller-scale photogrammetry work at the museum. They will continue their research throughout the spring semester. For more information about the University's geology program, visit http://www.unr.edu/geology.